30 years ago, two significant moments in Australian music industry history arrived out of a passion and love of Australian contemporary music. The first was the inception and staging of the inaugural ARIA Awards. 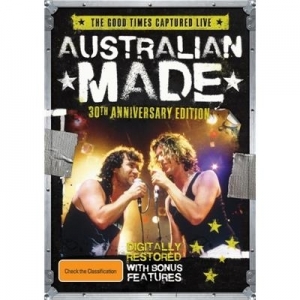 The second was the staging of a series of 6 outdoor one-day festivals in the summer of 1986/87 under the banner AUSTRALIAN MADE - an ambitious idea borne out of frustration for the lack of respect, and recognition of, our country's musicians. Both events not only broke the rules, they forever changed the perception on how we, as a country, viewed our place on the world stage when it came to music. Concert includes live performances by INXS, Jimmy Barnes, Divinyls, The Triffis, The Models, The Saints and I'm Talking.